Myrtle Beach has been my happy place to unwind after a busy show schedule. Every time I walk on the beach it seems to make my brain forget all the hustle bustle I’ve left at home. One night I was walking on the downtown section of the beach and the lights of the Sky Wheel and all of the hotels made dazzling reflections in the high tide waves rolling in. The moon soon joined in casting its reflections, and I took out my phone and took as many photos as I could to capture the moment for a later painting. 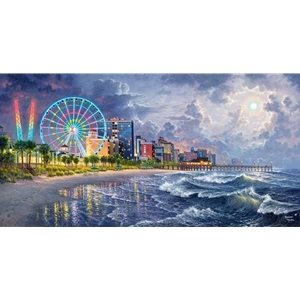 When I finished this piece a friend told me that Myrtle Beach is often referred to as The Grand Strand! Thanks to her inspiration the title was born.